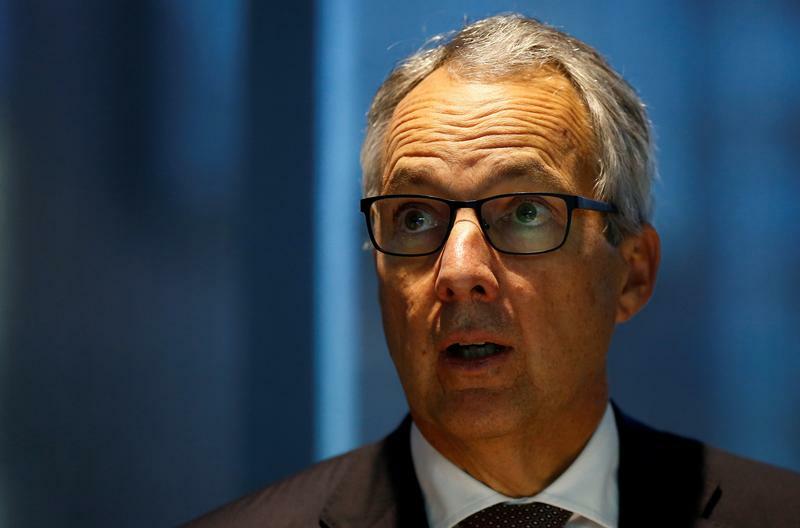 Macquarie Group CEO Nicholas Moore speaks at a press conference after the bank's full year results were announced in Sydney, Australia, May 6, 2016. Macquarie Group said on Nov. 2 that first-half earnings increased 5 percent to A$1.3 billion ($938 million), as strength in its commodities and capital markets divisions offset declines in asset management and corporate finance. It also upgraded profit guidance and put on hold a A$1 billion share buyback programme. The Australian investment bank expects an increase of around 10 percent in full-year earnings, excluding the sale of Quadrant Energy. It had said in July that its result for the year to the end of March 2019 would be “broadly in line” with the previous 12 months. Macquarie shares were up 3.3 percent in afternoon trading, at A$121.72 apiece. In July, the company chose Shemara Wikramanayake, head of its asset management unit, to be its next chief executive, replacing Nicholas Moore, who will retire at the end of November.